Build Your Custom Luxury Estate Home in The Grange Country Estates - Canterbury Homes Inc. When would you like to begin construction? With smaller urban lot sizes, house hunters are searching Edmonton, Sherwood Park and surrounding areas in order to build the custom home of their dreams. For many, The Grange Country Estates offers country living, while being close to urban amenities. The Grange Country Estates is located on a former farm site on Range Road 223, directly south of Wye Road. The land is heavily forested and developers made plans to ensure that a large portion of the land remains unaltered for moose, deer, coyotes, and other wildlife habitat. South-facing aerial view of The Grange Country Estates prior to development. It is just a 5 minute drive into Sherwood Park, offering quick access to services and entertainment options. There are a total of 50 partially and fully treed lots in The Grange subdivision, ranging from half acre to one acre in size. 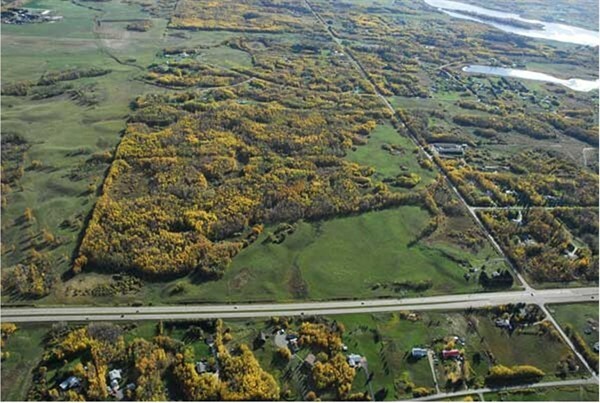 These larger lots sizes will allow ample room for a large luxury home. Each luxury home backs onto forest, which surrounds the community and is home to a wide range of native wildlife. There are plans for walking paths throughout the land; the use of motorized vehicles within its boundaries is not permitted, ensuring that residents enjoy peace and tranquility. Each home within The Grange Country Estates is unique to its owners. No two are the same. More than half of the lots back onto forest and residents are encouraged to take advantage of their boreal views (including the occasional moose foraging in your backyard) by building walkout bungalow or two-storey homes. The average lot sells for about $350,000 and all but a handful have been purchased. See lot availability here. With few lots available, you will have to act quickly to secure your place in The Grange. Building your home as the community nears completion means soon you will enjoy the absence of construction interruptions. For many, choosing to build a custom home in Sherwood Park is an easy choice. Are you thinking about building in The Grange Country Estates? Canterbury Homes can bring your custom home to reality. We offer innovative design solutions, professional craftsmanship, and a hassle-free, personalized home building experience. The dream home in the country you’ve always wanted is within your reach. Let’s talk about your plans today! Call us at 780.417.8872 or Contact Us online.